So, I've been buying a lot of beer lately. A lot. Buying, along with trades, and people just being kind and giving me beer have really put a dent in my fridge. Or a lack of a dent, really. I couldn't fit a damn thing in there. And I kept buying and buying. Soon, the the vegetable crisper s were full. BEER EVERYWHERE. Now, without a second fridge and no real place to put one, I had to come up with a plan. 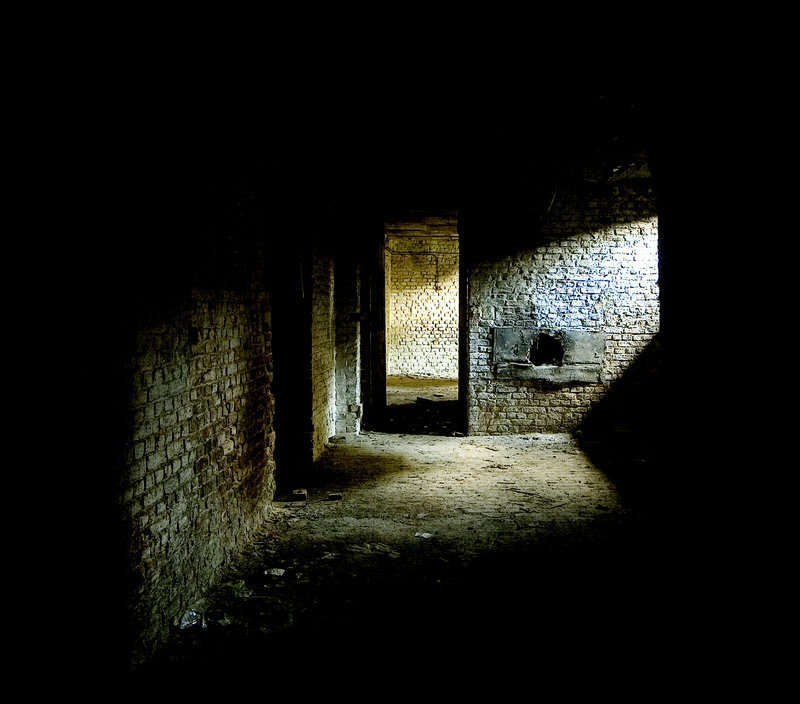 That plan included glue sticks, a box of crayons, an empty soup can, a bunch of beers, and a dark, cool, creepy basement. Sounds like a fun Friday night, huh? Cambridge Brewing Sgt. Pepper, and Stone Brewing Vertical Epic 12.12.12. Once I made the decision, It was time to get to work. I did a bit more research into finding out the best way to make them last the year that I was planning on giving them. A lot of results ended up being wax. You know, like Makers Mark, or higher end beers. It supposedly helps reduce the oxidizing. But it absolutely looks awesome.Wanting to keep my projects as DIY as possible, I found there is a way to make your own wax at home involving the creepy products I mentioned earlier. Let's have a gander at our tools for today's project, and see what they are for! 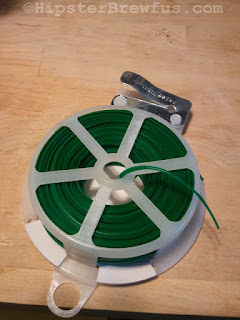 First thing I did was cut a bunch of strips about 3" long and looped them around the top to fashion a pull tab of sorts. Ok, so I initially started with a ratio of 10 glue sticks (4" long and about 1/4" diameter) to 7 crayons. 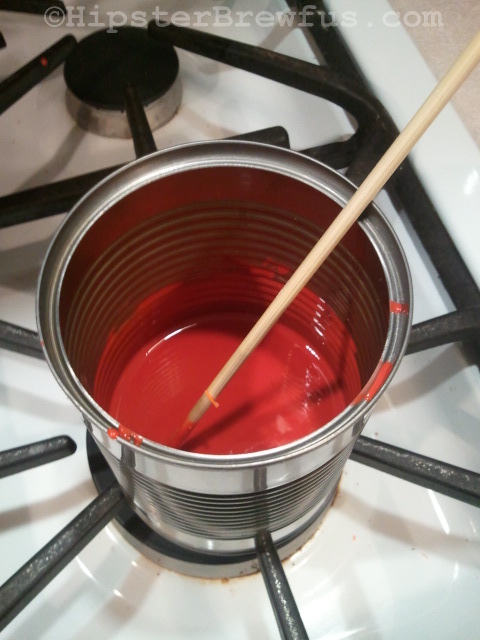 On a low heat, I combined the two in an empty soup can and stirred using a disposable skewer. After about 10-15 minutes, I had a nice consistency that I was happy with. I wasn't happy with the quantity though, so I added 6 more glue sticks, and 5 more crayons. I was ready to rock and roll inside of 20 minutes total. 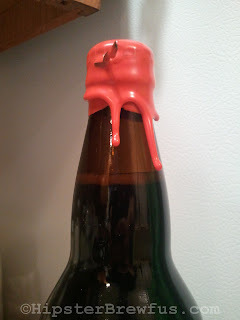 Dipping the end of each bottle right into wax, I let a majority of the excess drip off before I flipped the bottle. Doing science looked like a lot of fun, so Anna got in on it and dipped a few bottles herself. 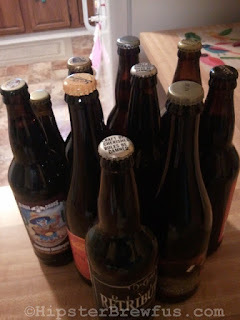 The bottles looked great, and silly me, had a lot of mix left over. 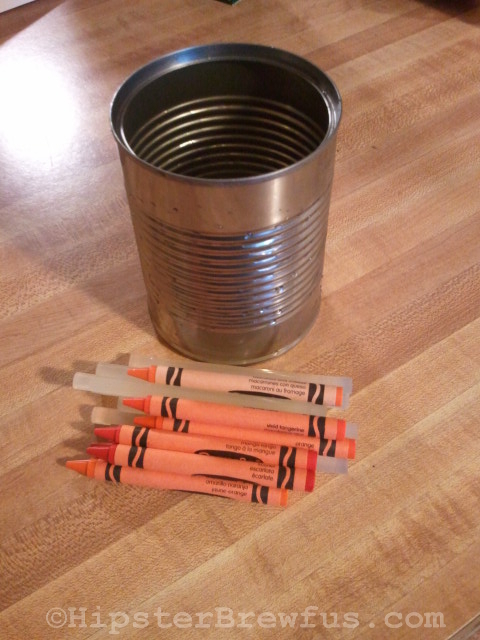 I probably could have gotten away with the original mix ration of 10 glue sticks to 7 crayons. But no big deal. 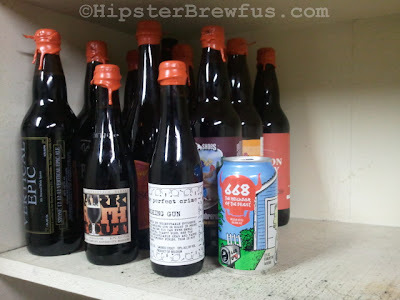 The only thing I noticed was some of the bottles had some cracking in the wax. I used the end of my mixing skewer, dipped it into the remaining goop, and "glued" the cracks up. I'm a little curious what would help them not crack. I think perhaps more of an even glue to crayon ratio. Either way, I was mostly happy. 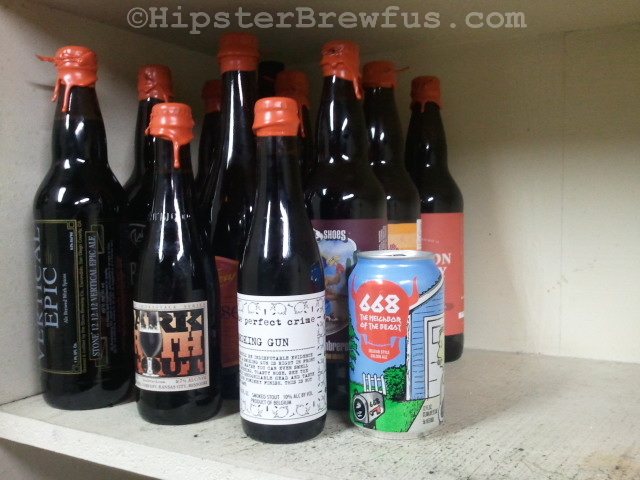 I logged my newly created beer cellar in my Moleskin Beer Journal, hauled the beers into my basement, and called it a day. And thus began my first aging project. See you next year, kids! Love the zip tie material idea. Well done! Great idea!! 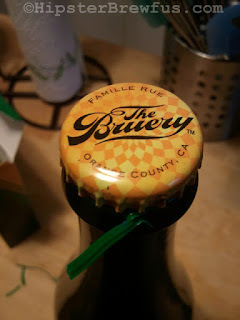 Will keep this in mind when I start bottling. You'll have to let me know when you give it a shot. I feel like I saw some pictures of this on imgur. 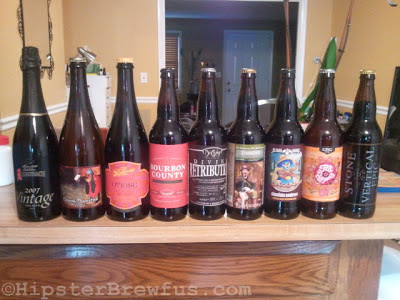 Was that you, or another genuis beer geek? I'm lucky in that I have some extra space in the basement. When we remodeled our kitchen last year, I was able to move our old fridge down there, and now it's my permanent "beer cellar". I adjusted the temperature so that it's about as high as a fridge can go (mid-50s); works like a charm. Hey Jeremy, thanks for reading. The picture you saw was definitely me! Im JakeBagadonuts on imgur! And that sounds awesome. One day I'll probably do the same thing, but a full size isn't in the cards right now.